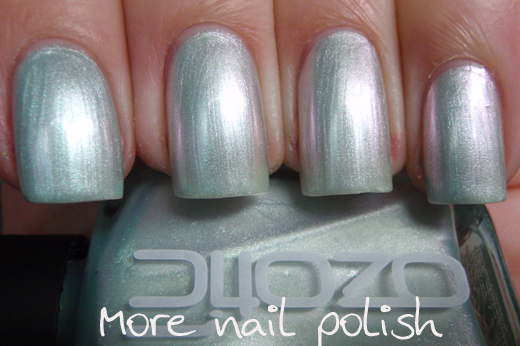 Today I have another of the Ozotic 700 series that was sent to me by the girls at piCture pOlish. To be honest, when I first saw Ozotic 751 in the bottle I was worried it was going to be a frosty hot mess. I was so pleasantly surprised when I wore this. The frostiness didn't freak me out at all and I was strangely attracted to it's angel like ethereal appearance. 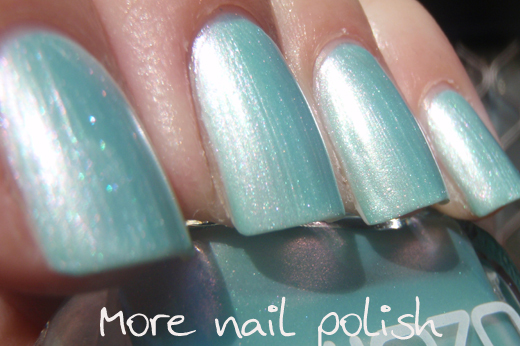 Ozotic 751 is a very pale ice blue polish that is make up of a somewhat frosty micro shimmer. 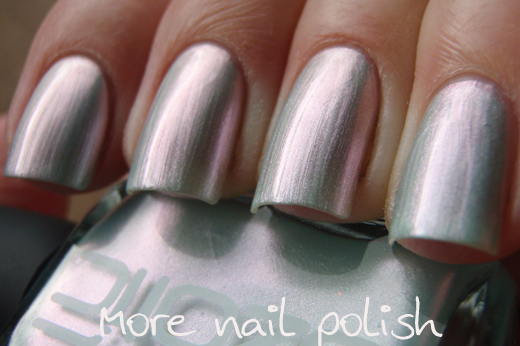 The duochrome shift in this, is that the ice blue shimmer bits shift to a pinky mauve. This is two coats of 751 on its own, with Seche Vite top coat. 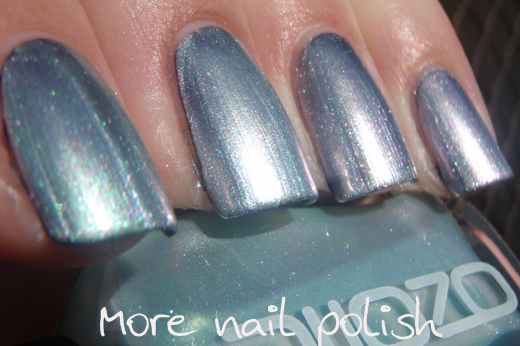 For such a light and shimmery polish, it covers relatively well in just two coats. On the edges of my fingers you can start to see the pink glow. Ok, over black I don't think I'm as much of a fan. At one coat is was a little too streaky, and and two coats it really hid the black base. And I think the black base brings out more frostiness in this polish. Of course the black base also brings out more of the pink colour shift too. Finally over white. It's not that different to it on its own, except that you really don't have any visible nail line. Over white you don't see the streaks so much, and it is very shimmery and shiny in the sun. Again I was very surprised how much I really liked this look. I think this polish may just have convinced me that not all frosty polishes are horrible, some - like this one- are really very beautiful. The formula on this was great too. No lumps or bubbles like you often see with frosty polishes. This was two coats over a white base with Seche Vite on top. So do you hate frosty polishes with the wrath of a thousand suns? I thought I did, but apparently I don't. With an absolute passion! I can't handle the brushstrokes to the point where I even hate metallics and foils too! This looks pretty but the brush strokes would drive me crazy. I haven't tried it but I read somewhere that you can sponge on the top layer of a streaky polish so you dont end up with the lines. Have to try it one of these days! It really does work! I do this with all of my frosty/brushstroke prone polishes. Just make sure that your initial coats are dry before you sponge on the final layer. You can get a really nice satin effect from frosts by doing this, then adding regular topcoat to preserve a little sheen and smooth the surface, then following it with a matte topcoat. It works really well, I use this technique with all my frosty/brushstroke prone polishes. Make sure your initial coats are dry before sponging though or it can get a little messy. You can get a really nice satin effect from frosts too by applying them this way, adding a regular topcoat to smooth the surface and preserve a little sheen, then finishing with a matte topcoat.